ROME, May 11, 2009 – On his trip to the Holy Land, Benedict XVI has dedicated the first three days to Jordan. On previous papal voyages, the stay in this Muslim kingdom was more fleeting, as were the references to Islam. The new development has taken place with pope Joseph Raztinger. Relations with Islam have been at the center of the first part of his trip. And they will be given further visibility in Jerusalem, with the visit to the Dome of the Rock, recognized by Muslims as the spot from which Muhammad ascended to heaven. Naturally, from the start Benedict XVI has stamped his trip with the imprint of a Christian pilgrimage, with careful attention to Christianity’s roots in Judaism. In Jordan, he began by going up on Mount Nebo, and from there, like Moses, looking at the Promised Land. There, he recalled “the inseparable bond that unites the Church to the Jewish people.” And he finished by going to Bethany “beyond the Jordan,” to the place where the last of the prophets, John the Baptist, baptized Jesus. At each stage, he met with and encouraged the Christians living in that land, small communities very much in the minority, for whom life is not easy. He celebrated the first public Mass of the trip with them in Amman, on Sunday, May 10. In the homily, he immediately stressed for them what had just been read: that apart for Jesus “there is no name under heaven given to men by which we are to be saved” (Acts 4:12). But it was in relation to Islam that Benedict XVI’s remarks in Jordan were most fully elaborated, on two occasions in particular: when he blessed the first stone of a new Catholic university in Madaba, for students who will be mostly Muslim, and when he visited the Al-Hussein Bin Talal mosque in Amman. “Belief in God does not suppress the search for truth; on the contrary it encourages it. Saint Paul exhorted the early Christians to open their minds to ‘all that is true, all that is noble, all that is good and pure, all that we love and honor, all that is considered excellent or worthy of praise’ (Phil 4:8). Religion, of course, like science and technology, philosophy and all expressions of our search for truth, can be corrupted. Religion is disfigured when pressed into the service of ignorance or prejudice, contempt, violence and abuse. In this case we see not only a perversion of religion but also a corruption of human freedom, a narrowing and blindness of the mind. Clearly, such an outcome is not inevitable. Indeed, when we promote education, we proclaim our confidence in the gift of freedom. The human heart can be hardened by the limits of its environment, by interests and passions. But every person is also called to wisdom and integrity, to the basic and all-important choice of good over evil, truth over dishonesty, and can be assisted in this task. But it was in Amman, visiting the Al-Hussein Bin Talal mosque, that Benedict XVI entered most directly into the heart of the matter. The place and the audience were rich in significance. The pope was hosted by Prince Ghazi Bin Muhammad Bin Talal, 42, cousin of the current king of Jordan, Abdullah II, the son of the deceased King Hussein after whom the mosque is named. Prince Ghazi is the most authoritative proponent of the open letter “A common word between us and you,” addressed to the pope and to the heads of the other Christian confessions in October of 2007 by 138 Muslim figures from many different countries. The letter was the most important follow-up, from the Muslim camp, to the dialogue that Benedict XVI opened with his memorable lecture at the University of Regensburg on September 11, 2006. The letter of the 138 gave rise to a permanent forum of Catholic-Muslim dialogue, the first session of which was held in Rome from November 4-6, 2008, which concluded with a meeting with the pope. 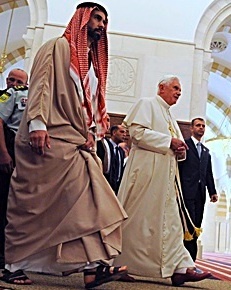 In Amman, on Saturday, May 9, Prince Ghazi first accompanied Benedict XVI on his visit to the mosque – where both had a “moment of recollection” – and then, outside of the building, addressed an extensive welcome speech to him, followed by the remarks of the pope. The complete texts of the two speeches are presented below. Prince Ghazi’s, delivered in English and unpublished until now, was carefully transcribed by “L’Osservatore Romano,” which published only a brief summary of this. The pope’s speech revisits themes and arguments that he has already developed in previous discourses, while Prince Ghazi’s seems more unusual, especially in a Muslim world that until now has been almost entirely in the dark about the progress underway in dialogue with the Catholic Church. In fact, Benedict XVI’s visit to Jordan has marked a new development in this regard as well. Thanks to the worldwide public impact of the trip and to the exchange of speeches between the pope and Prince Ghazi, a “common word” of dialogue between the Catholic Church and Islam has for the first time reached a portion of Muslim public opinion, to an unprecedented extent. It is a source of great joy for me to meet with you this morning in this magnificent setting. I wish to thank Prince Ghazi Bin Muhammed Bin Talal for his kind words of welcome. Your Royal Highness’s numerous initiatives to promote inter-religious and inter-cultural dialogue and exchanges are appreciated by the people of the Hashemite Kingdom and they are widely respected by the international community. I know that these efforts receive the active support of other members of the Royal Family as well as the nation’s government, and find ample resonance in the many initiatives of collaboration among Jordanians. For all this, I wish to express my own heartfelt admiration. For this reason we cannot fail to be concerned that today, with increasing insistency, some maintain that religion fails in its claim to be, by nature, a builder of unity and harmony, an expression of communion between persons and with God. Indeed some assert that religion is necessarily a cause of division in our world; and so they argue that the less attention given to religion in the public sphere the better. Certainly, the contradiction of tensions and divisions between the followers of different religious traditions, sadly, cannot be denied. However, is it not also the case that often it is the ideological manipulation of religion, sometimes for political ends, that is the real catalyst for tension and division, and at times even violence in society? In the face of this situation, where the opponents of religion seek not simply to silence its voice but to replace it with their own, the need for believers to be true to their principles and beliefs is felt all the more keenly. Muslims and Christians, precisely because of the burden of our common history so often marked by misunderstanding, must today strive to be known and recognized as worshippers of God faithful to prayer, eager to uphold and live by the Almighty’s decrees, merciful and compassionate, consistent in bearing witness to all that is true and good, and ever mindful of the common origin and dignity of all human persons, who remain at the apex of God’s creative design for the world and for history. Distinguished friends, today I wish to refer to a task which I have addressed on a number of occasions and which I firmly believe Christians and Muslims can embrace, particularly through our respective contributions to learning and scholarship, and public service. That task is the challenge to cultivate for the good, in the context of faith and truth, the vast potential of human reason. Christians in fact describe God, among other ways, as creative Reason, which orders and guides the world. And God endows us with the capacity to participate in his reason and thus to act in accordance with what is good. Muslims worship God, the Creator of Heaven and Earth, who has spoken to humanity. And as believers in the one God we know that human reason is itself God’s gift and that it soars to its highest plane when suffused with the light of God’s truth. In fact, when human reason humbly allows itself to be purified by faith, it is far from weakened; rather, it is strengthened to resist presumption and to reach beyond its own limitations. In this way, human reason is emboldened to pursue its noble purpose of serving mankind, giving expression to our deepest common aspirations and extending, rather than manipulating or confining, public debate. Thus, genuine adherence to religion – far from narrowing our minds – widens the horizon of human understanding. It protects civil society from the excesses of the unbridled ego which tend to absolutize the finite and eclipse the infinite; it ensures that freedom is exercised hand in hand with truth, and it adorns culture with insights concerning all that is true, good and beautiful. This understanding of reason, which continually draws the human mind beyond itself in the quest for the Absolute, poses a challenge; it contains a sense of both hope and caution. Together, Christians and Muslims are impelled to seek all that is just and right. We are bound to step beyond our particular interests and to encourage others, civil servants and leaders in particular, to do likewise in order to embrace the profound satisfaction of serving the common good, even at personal cost. And we are reminded that because it is our common human dignity which gives rise to universal human rights, they hold equally for every man and woman, irrespective of his or her religious, social or ethnic group. In this regard, we must note that the right of religious freedom extends beyond the question of worship and includes the right – especially of minorities – to fair access to the employment market and other spheres of civic life. Before I leave you this morning I would like to acknowledge in a special way the presence among us of His Beatitude Emmanuel III Delly, Patriarch of Baghdad, whom I greet most warmly. His presence brings to mind the people of neighboring Iraq many of whom have found welcome refuge here in Jordan. The international community’s efforts to promote peace and reconciliation, together with those of the local leaders, must continue in order to bear fruit in the lives of Iraqis. I wish to express my appreciation for all those who are assisting in the endeavors to deepen trust and to rebuild the institutions and infrastructure essential to the well-being of that society. And once again, I urge diplomats and the international community they represent together with local political and religious leaders to do everything possible to ensure the ancient Christian community of that noble land its fundamental right to peaceful coexistence with their fellow citizens. Distinguished friends, I trust that the sentiments I have expressed today will leave us with renewed hope for the future. Our love and duty before the Almighty is expressed not only in our worship but also in our love and concern for children and young people – your families – and for all Jordanians. It is for them that you labor and it is they who motivate you to place the good of every human person at the heart of institutions, laws and the workings of society. May reason, ennobled and humbled by the grandeur of God’s truth, continue to shape the life and institutions of this nation, in order that families may flourish and that all may live in peace, contributing to and drawing upon the culture that unifies this great Kingdom! “Pax vobis.” On the occasion of this historic visit to the Al-Hussein Bin Talal mosque here in Amman, I bid Your Holiness Pope Benedict XVI welcome in four ways. First, as a Muslim. I bid Your Holiness welcome today as we understand this visit to be a deliberate gesture of good will and mutual respect from the supreme spiritual leader and pontiff of the largest denomination of the world’s largest religion to the world’s second-largest religion. Indeed, Christians and Muslims make up over 55% of the world’s population and so it is especially significant that this is only the third time in history a reigning pope has visited a mosque, the first being by Your Holiness’s much-beloved predecessor, Pope John Paul II, to the historical Umayyad mosque in Damascus, which contains the remains of John the Baptist in 2001, and the second being by Your Holiness to the magnificent Blue Mosque in Istanbul in 2006. The beautiful King Hussein mosque in Amman, Jordan is Jordan’s state mosque, and it was built and personally supervised by His Majesty King Abdullah II in loving honor of his late father, Jordan’s great King Hussein, may God have mercy on his soul. Thus, this is the first time in history that a pope has ever visited a new mosque; hence, we see in this visit a clear message of the necessity of interfaith harmony and mutual respect in the contemporary world, as well as concrete proof of the willingness of Your Holiness to personally take a leading role in this. This gesture is all the more remarkable, given the fact that this visit to Jordan by Your Holiness is primarily a spiritual pilgrimage to the Christian Holy Land, and in particular to the site of the baptism of Jesus Christ by John the Baptist at Bethany beyond the Jordan, John 1:28 and John 3:26. And yet Your Holiness has made time, in your intense and tiring schedule, tiring for a man of any age, for this visit to the King Hussein mosque, in order to honor Muslims. I must also thank Your Holiness, for the regret you expressed after the Regentsburg lecture of September 13, 2006, for the hurt caused by this lecture to Muslims. Of course Muslims know that nothing that can be said or done in this world can harm the Prophet, who is, as his last words attested, with the highest companion, God himself, in paradise. But Muslims were, nevertheless, hurt because of their love for the Prophet, who is, as God says in the Holy Qu’uran, closer to the believers than their own selves. Hence, Muslims also especially appreciated the clarification by the Vatican that what was said in the Regensburg lecture did not reflect Your Holiness’s own opinion, but was rather simply a citation in an academic lecture. It hardly needs to be said, moreover, that the prophet Muhammad, whom Muslims love, emulate, and know as a living reality and spiritual presence, is completely and entirely different from the historical depictions of him in the West, ever since St John of Damascus. These distorted depictions by those who either do not know Arabic or the Holy Qur’an or who do not understand the historical and cultural contexts of the prophet’s life, and thus misunderstand and misconstrue the spiritual motives and intentions behind many of the prophet’s actions and words, are unfortunately responsible for much historical and cultural tension between Christians and Muslims. Finally, I must thank Your Holiness for many other friendly gestures and kindly actions towards Muslims since your ascension in 2005, including graciously receiving both His Majesty King Abdullah II Bin Al-Hussein of Jordan in 2005, and His Majesty King Abdullah Bin Ad-Al-Haziz of Saudi Arabia, the custodian of the two holy places, in 2008. And also especially for your warm reception of the historical or common word between us and you, the open letter of October 13, 2007, by 138 leading international Muslim scholars, whose numbers continue increasing to this day. It was as a result of this initiative, which, based on the Holy Qur’an and the Bible, recognized the primacy of the love of God and the love of neighbor in both Christianity and Islam, that the Vatican, under Your Holiness’s personal guidance, held the first seminar of the international Muslim-Catholic forum, from November 4-6, 2008. Second, as a Hashemite, and a descendant of the prophet Muhammad. I also bid Your Holiness welcome to this mosque in Jordan remembering that the prophet Muhammad welcomed his Christian neighbors from Najran to Medina, and invited them to pray in his own mosque, which they did in harmony, without either side compromising their own spiritual beliefs. This too is an invaluable lesson which the world desperately needs to remember. Third, as an Arab, and a direct descendant of Ishmael Ali-Salaam, of whom the Bible says God would make a great nation, Genesis 21:18, and that God was with him, Genesis 21:20, I bid Your Holiness welcome. One of the cardinal virtues of the Arabs, who traditionally have survived in some of the hottest and most inhospitable climates in the world, is hospitality. Hospitality is born of generosity, and it recognizes the needs of the neighbor and considers those who are far, or who come from far, as neighbors, and indeed this virtue is confirmed by God in the Holy Qur’an with the words: “And worship God, and associate man with him, be kind to parents, and near kindred, and to orphans, and to the needy, and to the neighbor who is far and to the neighbor who is near, and to the neighbor who is a stranger, and to the friend at your side. And to the wayfarer, and to what your right hands possess, surely God loves not the conceited and the boastful. Arab hospitality means not only loving to give and help, but also being generous of spirit, and thus appreciative. In 2000, during the late Pope John Paul II’s visit to Jordan, I was working with the Jordanian tribes, and some of the tribesmen were saying that they really liked the late pope. Someone asked them: “Why do you like him?”, since he was a Christian and they were Muslims. They smiled and said: “Because he visited us.” And of course, the late Pope John Paul II, like yourself, Holiness, could have easily gone to Israel and Palestine, but instead chose to start his pilgrimage with a visit to us here in Jordan, which we appreciate. Fourth and finally, as a Jordanian, I bid Your Holiness welcome. In Jordan, everyone is equal before the law, regardless of religion, race, origin or gender, and those who work in the government are responsible to do their utmost to care for everyone in the country with compassion and with justice. This was the personal example and message of the late King Hussein, who over his long reign of 47 years, felt for everyone in the country as he did for his own children. It is also the message of his son, His Majesty King Abdullah II, who accordingly has made it the singular goal of his life and reign, to make the life of every Jordanian and indeed every person in the world that he can reach, as decent, dignified, and happy as he possibly can, with Jordan’s meager resources. Today, Christians in Jordan enjoy, by law, eight percent of the seats in Parliament and similar quotas at every level of government and society, even though their numbers are less than that in actual fact. In addition to their own personal status laws and church courts, their holy sites, and their legal educational institutions and other needs are safeguarded by the state. And Your Holiness has just seen this in person, at the new Catholic university of Madaba, and will, God willing, soon see the new Catholic cathedral and the new Melkite church at the baptism site. And so Christians prosper today in Jordan, as they have for the last two thousand years, in peace and harmony, and with good will and genuine brotherly relations between them and their Muslim neighbors. This is, in part of course, because Christians used to be more numerous in Jordan percentagewise than they are today, but declining Christian birthrates and, conversely, high levels of education and prosperity which have led to their being in demand as immigrants to the West, have reduced their numbers. It is also, however, due to the fact that Jordan appreciates that Christians were in Jordan six hundred years before Muslims. Indeed, Jordanian Christians are perhaps the oldest Christian community in the world, and the majority have always been Orthodox, adherents of the Orthodox patriarchate of Jerusalem in the Holy Land, which, as Your Holiness knows better than I, is the church of St James, and was founded during Jesus own lifetime. Many of them are descended from the ancient Arab tribes, and they have, throughout history, shared the fate and struggles of their fellow Muslim tribesman. Indeed, in 630, during the Prophet’s own lifetime, they joined the Prophet’s own army, led by his adopted son, and his cousin, and fought against the Byzantine army of their fellow Orthodox, at the battle of Mechtar. It is because of this battle, that they earned their tribal name, which means “the reinforcements”, and Latin Patriarch Fouad Twal himself comes from these tribes. Then, in 1099, they were slaughtered by Catholic crusaders at the fall of Jerusalem, alongside their Muslim comrades. Later, from 1916 to 1918, during the Great Arab Revolt, they fought against Muslim Turks, alongside Arab-Muslim comrades. They thereafter languished for a few decades, along with their Muslim fellows, under a Protestant colonial mandate, and in the Arab-Israeli wars of 1948, 1967, and 1972, they fought with their Muslim-Arab comrades against Jewish opponents. Christian Jordanians have always not only defended Jordan but have also tirelessly and patriotically helped to build Jordan, playing leading roles in the fields of education, health, commerce, tourism, agriculture, science, culture, and many other fields. All this is to say, then, that whilst Your Holiness may believe them to be your fellow Christians, we know them to be our fellow Jordanians. And they are as much a part of this country as the land itself. We hope that this unique Jordanian spirit of interfaith harmony, benevolence and mutual respect, will serve as an example to the whole world, and Your Holiness will carry it to places like Mindanao and certain parts of sub-Saharan Africa, where Muslim minorities are hard-pressed by Christian majorities, as well as to other places, where the opposite is the case. Now, just as we welcome Your Holiness today in four ways, we receive Your Holiness today in four ways. First, we receive Your Holiness as the spiritual leader, Supreme Pontiff, and Successor of St Peter, for 1.1 billion Catholics, who are neighbors of Muslims everywhere, and whom we greet through receiving you. Second, we receive Your Holiness as Pope Benedict XVI, in particular whose reign has been marked by the moral courage to do and speak his conscience, no matter what the vogue of the day, who is personally also a master Christian theologian, responsible for historic encyclical letters on the beautiful cardinal virtues of charity and hope, who has refacilitated the traditional Latin Mass for those who choose it, and who has simultaneously made intrafaith and interfaith dialogue a top priority of his reign, in order to spread good will and understanding throughout all peoples of the world. Third, we receive Your Holiness as a head of state, who is also a world and global leader on the vital issues of morality, ethics, the environment, peace, human dignity, the alleviation of poverty and suffering, and even the global financial crisis. Fourth and finally, we receive Your Holiness as a simple pilgrim of peace who comes in humility and gentleness to pray where Jesus Christ the Messiah, may peace be upon him, was baptized and began his mission two thousand years ago.